We weren’t alone. We walked in solidarity with villagers in Gangjeong, South Korea, who’d welcomed many of us to join in their campaign to stop militarization of their beautiful Jeju Island. Seeking inter-island solidarity and recognizing how closely they share the plight of Afghans burdened by the U.S. “Asia Pivot”; our friends in Okinawa, Japan will host a walk from the north to the south of the island, protesting construction of a new U.S. military base in Henoko. Rather than provoke a new cold war, we want to shine light on our common cares and concerns, finding security in extended hands of friendship. On August 25th, some of the walkers will commit nonviolent civil resistance at Volk Field, carrying the messages about drone warfare and racial profiling into courts of law and public opinion. Too often we imagine that a life swaddled in everyday comforts and routines is the only life possible, while half a world away, to provide those comforts to us, helpless others are made to shiver with inescapable cold or fear. It’s been instructive on these walks to uncoddle ourselves a little, and see how our light shines, unhidden, on the road through neighboring towns, singing words we’ve heard from children learning to be as adult as they can be; attempting to learn that same lesson. The lyric goes l’m not going to make it shine: I’m just going to _let_ it shine. We hope that by releasing the truth that’s already in us we can encourage others to live theirs, shining a more humane light on the violent abuses, both at home and abroad, of dark systems that perpetuate violence. On walks like this we’ve been fortunate to imagine a better life, sharing moments of purpose and sanity with the many we’ve met along the road. We will hold a special vigil this month, the culmination of an eight day 90-mile walk for peace and justice, from the Dane County Jail to Volk Field. Anti-drone activists from across the country will be joining us, and we need you there. The vigil at Volk Field is a legal vigil where we will be on public property. As always, it will be a solemn vigil, remembering the victims of US government drone attacks. There will be a group who will engage in nonviolent civil resistance. If you are interested/willing to risk arrest, please contact Joy at 608 239-4327 or joyfirst5@gmail.com . Attached find a flyer with details on the kickoff event at Edgewood College on Monday August 17, details on the walk, and a copy of the press release. We invite all to join the walk from Madison to Volk Field as you are able. DIRECTIONS – To get to the vigil, take the Camp Douglas exit off Interstate 90/94 between Mauston and Tomah. When you exit take County Rd. C to the northeast. You will see the base straight ahead, but follow County Rd. C to the right and within a few blocks is a picnic wayside where you can park. The wayside is now open for the summer and bathrooms and parking are available. THE VIGIL – We will gather at the wayside between 3:00-3:15 for introductions and to review the plan for the vigil, and then process together to the gates of the base where we will hold a solemn vigil for one hour to remember those killed by drones. Participants can stand in silence or read poems and stories about the effects of drone warfare. It is important that the voices of the victims be brought to the gates of Volk Field. Bring posters if you can. A WORD ABOUT THE WEATHER – If you have questions about the vigil because of the weather, please make sure to call Joy at 608 239-4327 or Bonnie at 608 256-5088 for an update. CARPOOLING CHANGE FOR THIS MONTH ONLY- We want to have more cars driving up this month with extra seats so we can transport walk participants back to Madison after the vigil. If you need a ride or if you can drive and take walk participants back to Madison after the vigil, please contact Bonnie at 608 256-5088. We hope to see you at the vigil on Tuesday August 25. If you can’t come this time, mark your calendar for the 4th Tuesday of every month and join us when you can. If you have any questions please call or email Joy at 608 239-4327 or joyfirst5@gmail.com or Bonnie at 608-256-5088 or blbb24@att.net . The concept of any one nation taking the role of “global policing,” troubling in itself, becomes even more disconcerting when that nation shows consistent disdain for rule of law. The U.S. breaks international law by using armed drones, detaining and torturing prisoners, and testing nuclear weapons on native treaty lands. It violates the U.S. Constitution by profiling people of color. These violations call into question the notion of casting the U.S. in the role of world police. The U.S. is policing the globe using measures similar to tactics exercised, increasingly, by police patrolling the streets of U.S. cities and towns. The federal government issues assault weapons, even armored cars and tanks, to local police departments in cities large and small. Police are trained to view the people they are supposed to protect and serve as enemies. Let It Shine! is a 90-mile walk over 8 days. The walk includes various speaking events in cities and towns that we pass through and ends with a protest vigil at the gates of Volk Field on Tuesday Aug 25 at 3:30pm. Call us for more information about attending or participating. The daily walks range from 12 – 16 miles. Please join us whenever you are able! US drone strikes kill 28 unknown people for every intended target. 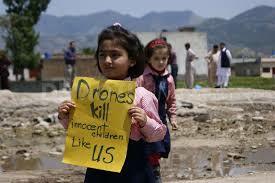 US drone strikes cause considerable psychological trauma in the daily lives of ordinary civilians. US drone pilots are leaving the military in large numbers because of psychological pressures. 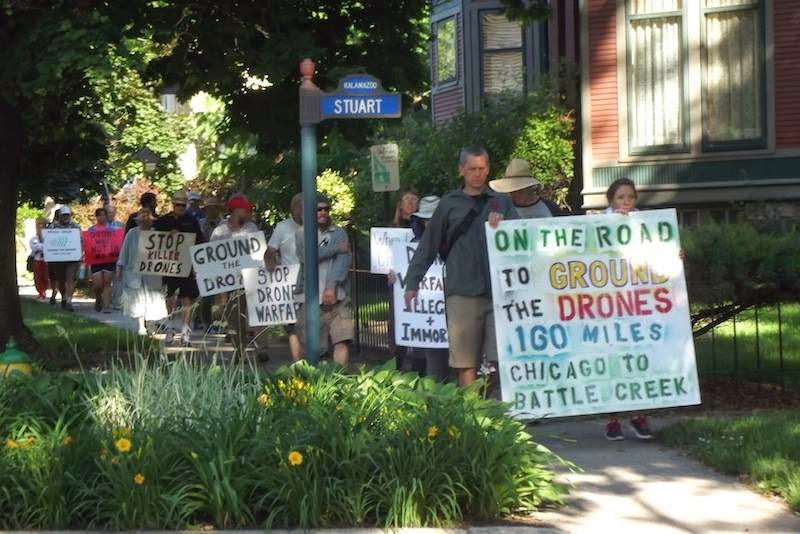 Madison–20 activists from across the U.S. will participate in a pro-peace, anti-drone demonstration and walk from August 17 – August 25th beginning in Madison, WI and ending outside of Volk Field. Marchers will be walking about 90 miles from Madison’s City-County Building to the Wisconsin Air National Guard base at Camp Douglas. The Air National Guard Base trains pilots to operate “Shadow Drones” that are used in surveillance, flying over other countries to determine targets for the Predator and Reaper drones. The walkers aim to educate the public on racial profiling both locally, as it relates to the propensity of police officers to use violence against people of color; and internationally, as it relates to the propensity of drone surveillance to target foreign nationals deemed “nefarious” on not much more than a hunch, resulting in the death of innocent people, including many children. On Monday, August 17, in Madison’s Edgewood College, a kick-off event will begin at 7:00 p.m. The daily walks will range from 12 -16 miles. In Baraboo, on August 21st, at 7:00 p.m., a public event will be held at the United Methodist Church at 615 Broadway. In Mauston on August 23rd walk participants will be part of a discussion on fracking in the Community Room of the Mauston City Hall from 7:00 pm – 8:30 pm. The walk ends on Tuesday, August 25th, with a vigil against drones, from 3:30 p.m. – 4:30 p.m. at the gates of Volk Field. Some individuals may engage in nonviolent civil resistance during the vigil. The Wisconsin Coalition to Ground the Drones and End the Wars has been holding monthly vigils at the gates of Volk Field for 3 ½ years. For information about daily starting times, and updates on where the walkers are at a given time, please call the contact numbers listed above. All lethal US drone strikes are guided via the Satellite Relay Station located on the US Air Force Base in Ramstein, Germany. More than 10,000 people worldwide have been killed by these drone strikes. The bin Ali Jaber family lost two of its members through a drone strike in Hadramout in Yemen. (ECCHR) have filed a lawsuit against the German government in a German court on behalf of the bin Ali Jaber family. The suit demands that the German government “take legal and political responsibility for the US drone war in Yemen”. The case will be heard in a German court on Wednesday May 27. Our vigil on May 26 will be in solidarity with many other actions around the world supporting this lawsuit. For more information on the lawsuit, go to http://reports.papillonweb.net/ . CARPOOLING – If you are interested in carpooling to Volk Field from Madison, please contact Bonnie at 608 256-5088 or Kathy at or 608 278-0483. We hope to see you at the vigil on Tuesday May 26. If you can’t come this time, mark your calendar for the 4th Tuesday of every month and join us when you can. If you have any questions please call or email Joy at 608 239-4327 or joyfirst5@gmail.com or Bonnie at 608-256-5088 or blbb24@att.net . Wisconsin Coalition to Ground the Drones holds a monthly vigil at Volk Field Air National Guard base near Tomah, WI. The Drone facility at Volk Field provides pilot training and field testing of Shadow drones, which are used for surveillance and target acquisition. The monthly vigil is legal and nonviolent. If you wish to join us please check with joyfirst@gmail.com in case of schedule changes.